Analytics for iOS makes it dead simple to send your data to any analytics or marketing tool without having to learn, test or implement a new API every time. All of our libraries are open-source, so you can view Analytics for iOS on Github, or check out our browser and server-side libraries too. Note: At the moment we can’t support tracking of watchkit extensions for the Apple watch. Email us if you’re interested in a watchkit SDK. For now we recommend tracking watch interactions via the iPhone app code. In the interest of keeping our SDK lightweight, the Analytics pod only installs the Segment destination. This means that all your data will be sent via Segment’s servers to any tools you’ve enabled by the default Cloud-based Connection Mode. As described here, some integrations require or offer Device-based Connection Modes. In those cases, you’ll need to take some additional steps as shown in the source documentation here. writeKey NSString * Your Segment source’s Write Key. Our SDK can automatically instrument common application lifecycle events such as “Application Installed”, “Application Updated” and “Application Opened”. Simply enable this option when you initialize the SDK. Our SDK can automatically instrument screen calls. It uses method swizzling to detect when ViewController’s are loaded and uses the label of the view controller (or the class name if a label is not available) as the screen name. It removes the string “ViewController” from the name (if present). Now that the Segment SDK and any accompanying packaged SDKs are installed, you’re ready to collect some data! We recommend calling identify a single time when the user’s account is first created, and only identifying again later when their traits are changed. Note: We automatically assign an anonymousId to users before you identify them. The userId is what connects anonymous activities across devices (e.g. iPhone and iPad). [[SEGAnalytics sharedAnalytics] identify:@"a user's id"
This call identifies a user by his unique User ID (the one you know him by in your database) and labels him with name and email traits. userId NSString *, optional The database ID for this user. If you don’t know who the user is yet, you can omit the userId and just record traits. You can read more in the identify reference. traits NSDictionary *, optional A dictionary of traits you know about the user, like their email or name. You can read more about traits in the identify reference. options NSDictionary *, optional A dictionary of extra options for the call. Analytics for iOS works on its own background thread, so it will never block the main thread for the UI or the calling thread. Calling - identify: with a userId will write that ID to disk to be used in subsequent calls. That ID can be removed either by uninstalling the app or by calling reset. To get started, our SDK can automatically track a few key common events with our Native Mobile Spec, such as the Application Installed, Application Updated and Application Opened. Simply enable this option during initialization. This example track call tells us that your user just triggered the Item Purchased event recording the item name of “Sword of Hercales” and revenue of 2.95.
track event properties can be anything you want to record. In this case, item and revenue. event NSString * The name of the event. We recommend human-readable names like Song Played or Status Updated. properties NSDictionary *, optional A dictionary of properties for the event. If the event was Product Added to cart, it might have properties like price and productType. The screen method lets you you record whenever a user sees a screen of your mobile app, along with optional extra information about the page being viewed. You’ll want to record a screen event an event whenever the user opens a screen in your app. This could be a view, fragment, dialog or activity depending on your app. name NSString * The name of the screen, for example Signup or Home. properties NSDictionary *, optional A dictionary of properties for the screen. A screen Photo Feed might have properties like Feed Type or Sort Order. Find details on the screen payload in our Spec. options Options, optional An Options object lets you set a timestamp, enable or disable destinations, or send additional context. newId NSString * The newId of the user you want to map to. The - reset method clears the SDK’s internal stores for the current user and group. This is useful for apps where users can log in and out with different identities over time. Note: disabling the Segment SDK ensures that all data collection method invocations (eg. track, identify, etc) are ignored; however, it does not tear down inititialized SDKs. If your packaged SDKs are collecting data automatically or outside of Segment, disabling Segment does not address that. We recommend invoking corresponding disable methods in each of your packaged SDKs in response to user opt-out to ensure any automatic data collection is stopped. The alias, group, identify, page and track calls can all be passed an object of destinations that lets you turn certain destinations on or off. By default all destinations are enabled. Note: Available at the business level, filtering track calls can be done right from the Segment UI on your source schema page. We recommend using the UI if possible since it’s a much simpler way of managing your filters and can be updated with no code changes on your side. These flags tell the Segment servers that a request was already made directly from the device through a packaged SDK. That way we don’t send a duplicate request via our servers to those services. By default debug logging is disabled. Middlewares are a powerful mechanism that can augment the events collected by the SDK. A middleware is a simple function that is invoked by the Segment SDK and can be used to monitor, modify or reject events. Middlewares are available on analytics-ios 3.6.0 and higher. The middleware API is easily accessible in both Objective-C and Swift. Middleware is any Objective-C class that conforms to the following protocol. context is an object that encapsulates everything about an event in the stream. next is a callback function that should be invoked when the current middleware is done processing the event and can pass the processed event down to the next middleware in the chain. SEGContext object is not very information rich by itself. Typically you will need to use eventType and payload to get more information about an event. If you look at SEGEventType more carefully, you’ll realize that middleware is not only capable of handling track , identify and other normal analytics APIs, even calls like reset , flush and openURL go through and can therefore be processed by the middleware pipeline. There are almost as many SEGPayload subclasses as there are SEGEventType enums. Subclassed payloads may contain call specific information, For example, the SEGTrackPayload contains event as well as properties . Finally, to use a middleware, you will need to provide it to the SEGAnalyticsConfiguration object prior to the initialization of SEGAnalytics . Once initialized, the list of middlewares used in SEGAnalytics cannot be changed at this time. let newEvent = "[New] \(track.event)"
let event = "\(screen.name) Screen Tracked"
You can point the iOS SDK to your own hosted proxy of the Segment API. This will run the HTTP traffic for the Segment API through the proxy. // Set a custom request factory which allows you to modify the way the library creates an HTTP request. // In this case, we're transforming the URL to point to our own custom non-Segment host. // Replace YOUR_PROXY_HOST with the address of your proxy, e.g. aba64da6.ngrok.io. // Set any other custom configuration options. // Initialize the SDK with the configuration. 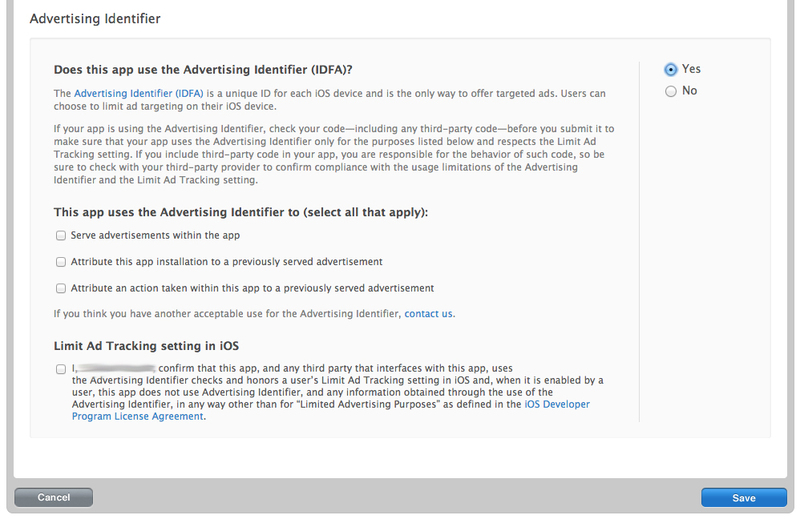 iOS users can opt into limited ad tracking (similar to ad-blocking for browsers). For those users that have opted in, adTrackingEnabled will come through as false; however there will still be an advertisingId present. Since the iOS 10 release, those who opt in for limited ad tracking will have adTrackingEnabled set to false AND there will either be no advertisingId or the advertisingId will be a series of zeroes. We publish stable releases every second Wednesday, when we tag and release the master branch. After releasing, we also merge the dev branch merged into master. In general, code will be available on master for two weeks before being tagged as a stable release. During this two week period, it is available for use via Cocoapods and Carthage — our equivalent of bleeding edge releases. We recommend using this version to try out upcoming features and fixes that have not been published yet. By default, our Analytics pod packages no external SDKs. If you would like to add any destinations with Device-based Connection Modes, first add the dependencies you need. You can find these in our app when you open the destination sheet for any mobile destination with a Device-based Connection Mode option. After adding the dependency, you must register the destination with our SDK. // Add any of your Device-based destinations. We recommend using Device-based destinations and Connection Modes sparingly to reduce the size of your application. How big is the Segment SDK? The core Segment SDK is extremely lightweight. It weighs in at about 212kb. Can I install the SDK Manually with a Dynamic Framework? We highly recommend using Cocoapods. However, if you cannot use Cocoapods or Carthage, you can manually install our dynamic framework allowing you to send data to Segment and on to enabled cloud-mode destinations. We do not support sending data to bundled, device-mode integrations outside of Cocoapods. Download the latest built SDK, and unzip the zip file. Drag the unzipped Analytics.framework folder into your XCode project. In the General Tab for your project, search for Embedded Binaries and add the Analytics.framework. Once you’ve installed the framework, just import the header file and install as described above in Install the SDK. Please note, if you are choosing to not use a dependency manager, you must keep files up-to-date with regularly scheduled, manual updates. What if your SDK doesn’t support feature X? If you’re using a Device-based Connection Mode for a mobile destination, if you want to access a feature from a tool’s native SDK, you can include the header file and call the method just as normal. For example, you might want access to Flurry’s location logging or Localytics’s attribution parameters. To use the destination’s SDK, just import the headers and then access the SDK as you would without Segment. We’ll still handle initialization, event, screen & user tracking, plus all the proxied services and data storage for you. How Do I Use Push Notifications? For services that send push notifications, you first want to create a Push SSL certificate following these steps. You then want to configure your application delegate to look like the code below, and replace your Segment source write key. How Do You Handle Unique Identifiers? A key component of any analytics platform is consistently and accurately identifying users. Some kind of ID must be assigned and persisted on the device so that user actions can be effectively studied. This is especially important for funnel conversion analysis and retention analysis. Naturally the Analytics SDK needs a unique ID for each user. To protect end-users’ privacy, Apple places restrictions on how these IDs can be generated and used. Here’s an explanation of these policies from Apple, and how we generate IDs in compliance. Before iOS 5 developers had access to uniqueIdentifier which was a hardware-specific serial number that was consistent across different apps, vendors and installs. Starting with iOS 5, however, Apple deprecated access to this identifier. In iOS 6 Apple introduced the identifierForVendor which protects end-users from cross-app identification. In iOS 7 Apple restricted access to the device’s MAC address, which was being used by many developers as a workaround to get a device-specific serial number similar to like uniqueIdentifier. Segment’s iOS library supports iOS 7+ by generating a UUID and storing it on disk. This is in line with the privacy policies required by Apple, maintains compatibility, and leaves open the option for multiple users on one device since the UUID can be regenerated. Should I include each service’s SDK alongside Segment? No, don’t include an SDK manually for a service we support. That will cause symbol conflicts/namespace collisions. Sometimes it can even fail silently :( So make sure you remove the old Google Analytics or Mixpanel SDK when you install Segment’s SDK. How does the SDK queue API calls? Our SDK queues API calls so that we don’t use up your user’s battery life by making a network request for each event tracked. Here’s how queuing works for server-side destinations: When you make an API call (e.g. -track:) that call is added to the queue. The SDK sends the events to the server in batches (by default, the batch size is 100). The batches are then sent either when there are 20 or more events in the queue, on a scheduled timer every 30 seconds, or when the app goes to the background. To limit memory and disk usage, we only queue upto 1000 events. When the app is terminated we persist the queue to disk and load that data at app launch so there is no data loss. The queue behavior may differ in packaged destinations. Can I set user traits without a User ID? Do you support iOS 5? Our SDK does not support iOS 5. If you need support for iOS 5 it’s possible by forking our iOS repo on GitHub and building the framework. Is The Segment SDK Compatible with Swift? Indeed! Swift’s compatibility with Objective-C lets you create a source that contains files written in either language, so to use our SDK from a Swift source just follow the instructions from Apple here. Can I help develop a destination? Yep! Our SDK is open-source. If you’d like to contribute, fix a bug, or add a destination - here’s documentation on how to do so. to add a destination, make sure you contact our partners team first. How do I know when a destination is initialized? The iOS library will post a notification to indicate when it initializes any destination so you can call it’s methods directly. // Call Mixpanel library methods here. If you’d like to centralize this logic, you can write a middleware for it! Some destinations, particularly mobile attribution tools (e.g. Kochava), require the IDFA (identifier for advertisers). The IDFA shows up in Segment calls in the debugger under context.device.advertisingId. In order for this value to be captured by the Segment SDK, ensure that you include the iAd framework. Once you enable this, you will see the context.device.advertisingId populate and the context.device.adTrackingEnabled flag set to true. Note: While the network is deprecated, the relevant framework is not. As of Version 3.3.0 we now have support for tvOS through our Analytics-iOS sdk. You can follow the iOS quickstart documentation and you should be good to go! tvOS installation is only supported via Carthage and CocoaPods. The dynamic framework installation method is not supported for tvOS. This was due to an old CocoaPods limitation. If the writeKey you have entered is a valid form but not the correct writeKey for your specific source, you will not see an error response. Data will be accepted by Segment but not able to be correctly routed to your source (debugger). Does the integration have device-mode/cloud-mode support? Confirm you are sending via the correct connection mode. Does the destination accept the type of call you are sending? Not all destinations accept all calls: page, track, etc. If you are still not seeing data in your destination, continue debugging based on which type of connection mode you are using. If you are using device-based connection mode, you should see the value of that integration set to false in the integrations object. That means that the data is being sent from the device to the destination SDK, and not through Segment’s servers. This is expected if you elected to use a device-based connection mode destination’s SDK with Segment’s during installation. Enable verbose logging and trigger the call in question. You should see a call to Segment triggered as well as to the partner SDK. It will show you exactly which partner method was invoked and the arguments it was invoked with! Look at the raw JSON in your debugger. Does the call look like what is expected? Read through the docs for that destination to see expected event format, behavior and caveats for that destination. v3 was an API compatible release, but there are a few additional steps for packaging destinations with Device-based Connection Modes and migrating from the older data format. Firstly, we changed how the anonymousId was stored between v2 and v3. You’ll need to read the old anonymousId and set it so that it’s moved to the new location. …and then register them in your configuration when you initialize the SDK. Note: If you are unsure about the name of the pod for a given SDK, you can always confirm on by searching for the destination in our app! // Add any of your Device-based destination components.